Today, I am excited to show you guys my great room. It's my second favorite room in the house (the kitchen is the first). There are still a few things we’d like to do with this space but I really love how minimal, light and airy this room is. 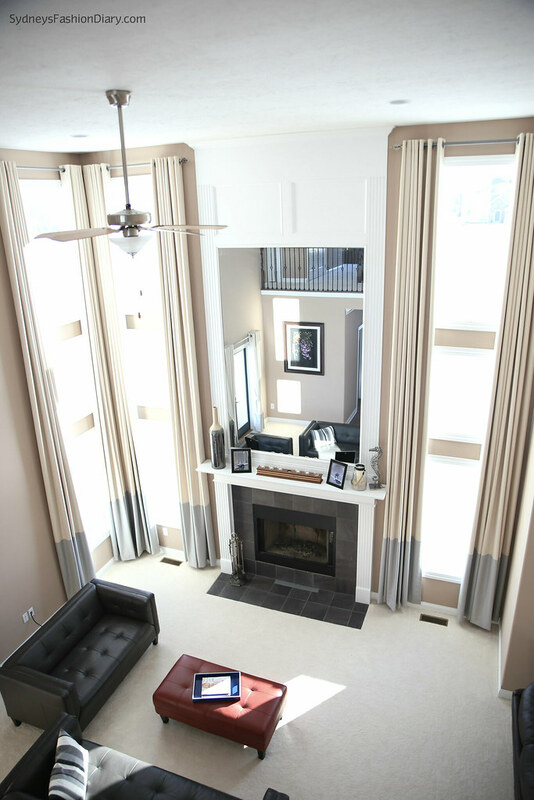 The design: The great room extends the open concept that begins with the two story entry. The entry hallway flows down the center of the house back to the great room. 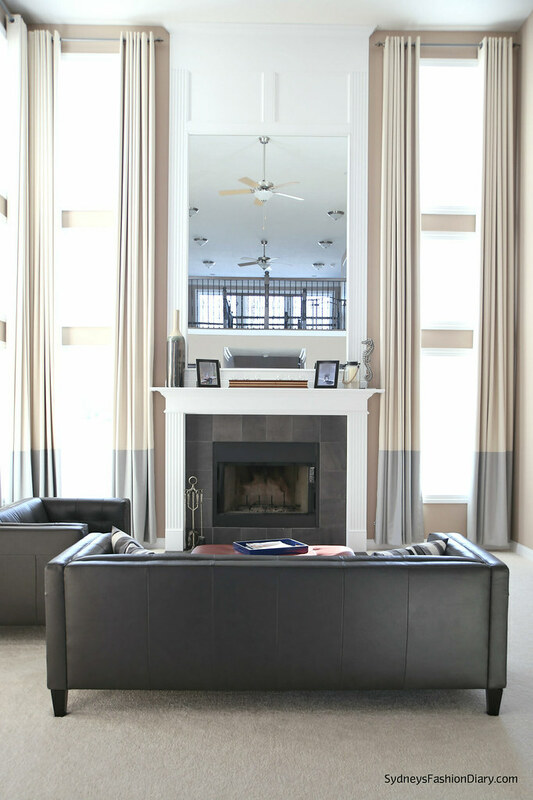 The focal point of the great room including the oversized fire place, mantel and 8 foot tall mirror are centered on the back wall. We made sure the fireplace is viewed prominently from the front entry and the fire place is dead center on the hallway center line. The 19 foot high ceilings in the great room allow plenty of natural light. The height of the ceilings, windows and light colors make the room feel airy and grand. Custom window treatments: Before the house was complete, we knew we needed to get a jump start on curtains for the house (especially the great room). 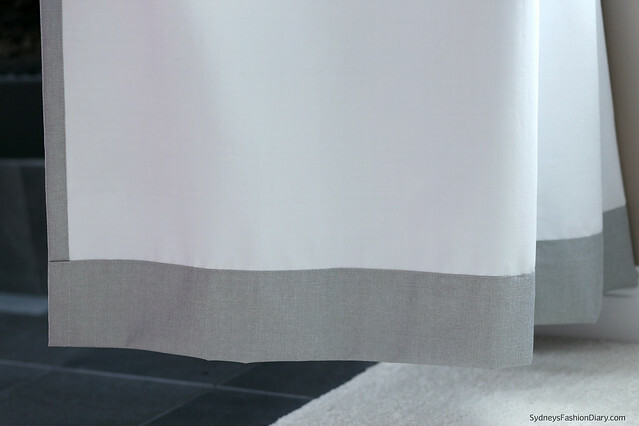 We knew there was a good possibility that we could purchase the curtains overseas, but we wanted to look at options locally. In doing so we quickly confirmed our suspicion that curtains for just the great room would cost a small fortune. A close friend in Vietnam helped with color and fabric choices and ultimately placed the order for us. We provided a measured drawing for the great room and detailed specifications. Once we place the order, it took about two weeks, including shipping. Shipping cost was not too bad at $200 considering the total investment was for the great room was $800 (including shipping). The heavy curtains hang from near ceiling to floor for a sophisticated, but contemporary look. They are also very functional given they are black out curtains. This reduces heat from long hours of Southern sun. Opposite the fireplace, on the second floor is the back cat walk. To the left and right, again on the second floor, are expansive walls. Though bare now, we think of them as blank canvases for artwork and a subtle beach theme in the future. 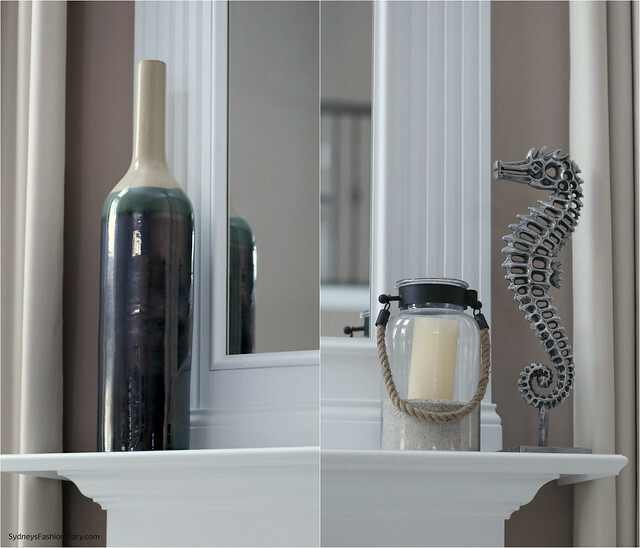 We've been collecting beach-themed decorating ideas/pieces for this future project. The great room borders the kids’ play room on the right (I will talk more about this room in a future post). There is also a second wide hallway serving the West side of the house that directly connects the kitchen to the great room. The floor is ideal for entertaining and keeping an eye on the kids from the kitchen. Everyone has a different idea of their "dream home". To us, a perfect home should be the home most compatible with the life you dream of living. This is our dream home - the home was designed with our family's needs in mind. I've never heard of a great room before - this looks amazing. I love the clean, classic look - I can see why it's your favorite room! So pretty! Love how huge those windows are! The room turned out beautifully, Sydney! I agree - it just looks very clean, open, and airy. I imagine it's a very relaxing space to hang out in! Stunning room! The drapes turned out so well and the length really shows off the high ceilings. I bet it would be my favorite room too! What a pretty room! Those windows make all the difference! How gorgeous is that room?! I mentioned it earlier on Twitter, but dang girl. Your great room comes straight out of a page of a home & decor magazine!! Your style is so clean and cozy- love!! Love the room! What kind of fabric did you use? Thanks! @Anonymous Sorry, I don't know the official name of the fabric. It's a textured vinyl-like material that completely blocks out sunlight. A stunning room, love the colours you've used and the windows are amazing. What a fabulous looking house! I love high ceiling and yours is REALLY high ceiling! I browsed through to see the 'making of' post and you really have a stunning house, congrats! As for us, life of an expat is almost like a Nomad, we will not be able to do much until we actually retire and decide where to finally 'lay our hats' Again, congrats to you and family on this beautiful house! LOVE It! The high ceiling is amazing and love the fire place! Wow, what an amazing spacious space! 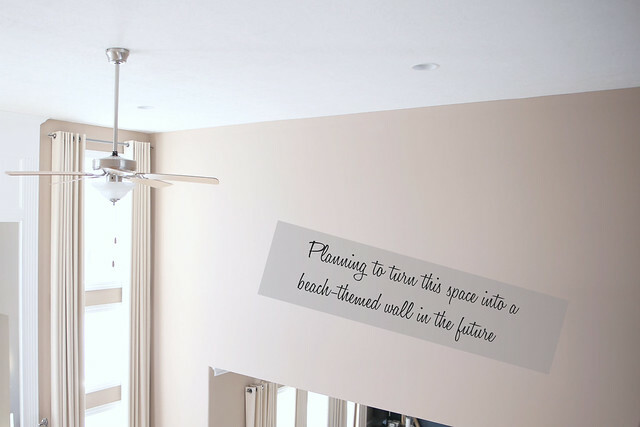 The future beach-theme wall sounds fun! I always wondered how scary it would be to change a light-bulb with high ceilings. Do you need to own a super-high ladder? @Olyvia Yes, we have a 20-ft extension ladder but it's still pretty scary to get up there. These pictures are really quite pretty! How you managed to fit the balcony and exclude unsightly storage bits from the mirror shot is amazing! And in real life, to see that high ceiling must be breath-taking! The entry hallway flows down the center of the house back to the great room.